Amidst the escalating focus on online counterfeiting, piracy and patent infringement, online social media, such as WeChat are also becoming a source of infringing products, as documented in a Wall Street Journal article and other journals. As the accused had intentionally sold a relatively large amount of counterfeit goods, the defendants were found guilty of the crime of selling commodities bearing counterfeit registered trademarks by the Shaoguan Zhengjiang District People’s Court of Guangdong Province. Sentences were imposed of 6 – 7 months and a fine of RMB 15,000. In my opinion, this case appears to be headed in the right direction in terms of addressing the use of social media to commit IP crimes. The court suggests that the case was important to fill in the gaps in the current legislative regime based on technological changes – the way in which criminals do business online. This is a typical evolution for IP-related case law in the United States, where courts have a record of using existing statutory provisions to address emerging technologies or ways of doing business. Why this case was categorized as promoting core socialist values? Perhaps it promotes socialist core values because it addresses problems in the market of unscrupulous unlicensed individuals who transact business without basic principles of good faith and fair dealing and is thus intended to send a policy signal to other courts and the legislative agencies. How do these cases compare to other types of cases that the court is promoting? In my opinion, China is paying more attention to cases to guide judicial decisions and create a more predictable legal environment, with 20,000,000 court cases available on line and new regulations on publishing cases in effect. China is seeking to develop a Chinese style system of precedent, and has elicited much government and academic involvement, including scholarship in journals. These cases need to be compared to the efforts to become more transparent, promote “model cases”, the system of guiding cases, judicial interpretations, etc., which are all part of an evolving system intended to insure greater consistency of judicial decision making and address emerging issues. Addendum of 1/1/2017: Here is a useful blog by Jeremy Daum from 31 August 2016 on the Beijing IP Court’s experiment in precedent, which lines up nicely with the perspective in my blog. As I have previously blogged here, China’s specialized IP courts are in fact a kind of misnomer: their jurisdictional bases are directed more towards technology-related IP (patents, technical secrets, plant varieties, semiconductor layout designs, software copyright). “Softer” IP (trademarks, copyright) is not their focus. In addition, they will provide a more professional appeals court from China’s patent and trademark office. Surprisingly, one of the most active areas of this court will be trademark administrative appeals, and not in the technology-related matters that is their raison d’etre. On October 30, 2014, the Beijing Higher People’s Court published a report on patent and trademark administrative appeals for the first nine months of 2014, which underscores the kind of docket that this new court will face. Trademark administrative cases increased drastically, from 2139 for all of 2013, to 7749 for the first nine months of 2014. If these 7749 cases were annualized, the total would be 10332 — a five-fold increase for 2014. Moreover, in 2013, about 50% of this docket involved foreigners. This court will be of key interest for foreigners. Patent administrative cases by comparison have been relatively stable and fewer. The data for 2013 also shows that about 35% of the cases involved foreigners. Chen Jinchuan (陈锦川) of Beijing Higher People’s Court also noted in a conference, that most foreign patentees are from the United States, Japan, and Germany, and that most of these cases involve invention patents. The two charts below are drawn from a 2014 article and a 2013 article . Data in the charts for 2014 is not annualized and may therefore understate the growth in the docket. According to the Beijing Intellectual Property Office, cases of review of refused trademark administrative cases, involve two parties (the Trademark Review and Adjudication Board of SAIC and the applicant), are relatively stable and thus easy for the court to handle. But other administrative cases involve three parties (SAIC, and the two parties contesting the right) and are more difficult for the court to handle. SAIC also reported that there was a big increase in TRAB activity in early 2014 in anticipation of trademark law reforms that went into effect this year. In fact, the cases filed in the courts in the first quarter in 2014 (2160) exceeded all cases for 2013. Is it worth foreigners’ filing cases to challenge the TRAB in the courts? The TRAB reported that its first instance success rate in the court was 82.8%. In other words, there is about a one-in-five chance of winning on appeal in the courts. During this past week, when world IP day is celebrated (April 26), the Supreme People’s Court once again released its white paper on Intellectual Property Protection by the Courts, available on line at the website of former Chief Judge Jiang Zhipei: http://www.chinaiprlaw.cn/file/2014042732499.html (English) and http://www.chinaiprlaw.cn/file/2014042732497.html (Chinese). The data shows some interesting developments. Growth Has Slowed Down And Foreigners Continue to Play a Relatively Small Role. The increase in the number of first instance civil cases received by all the local people’s courts have fell from the previous year’s growth rate of 45.99% to 1.33%, to about 90,000 cases. Newly received first instance administrative and criminal cases have also seen a changed trend, from prior year increases of 20.35% and 129.61%, to a decrease of 1.43% and 28%. Despite these trends, the number of first instance civil cases of intellectual property disputes involving foreign parties has grown, with a year-on-year increase of 18.75%. This still amounted to only a slight increase in the percentage of foreign related IP cases in the Chinese courts dockets, or 1,697 out of 88,286, a growth to 1.9% of the civil docket from last year’s 1.6%. Trademark Cases, Licensing Cases and AML Cases Showed Growth. There were 9,195 patent cases, 5.01% lower than 2012; 23,272 trademark cases, 17.45% higher; 51,351 copyright cases, 4.64% lower; 949 cases involving technology agreements, 27.21% higher; 1,302 cases involving unfair competition (of which, 72 were first instance civil cases involving monopoly disputes), 15.94% higher. No data was released on civil trade secret cases. The decline in patent disputes and increase in technology transfer cases is somewhat surprising, as one would expect growth in both areas in light of the rapid growth in China’s patent office and in China’s desires to become more innovative. Provisional measures still are rarely granted. The courts accepted 11 cases involving application for preliminary injunction relating to intellectual property disputes; 77.78% were granted approvals. One hundred and seventy three applications for pre-trial preservation of evidence were accepted, and 97.63% were granted approval, and 47 applications for pre-trial preservation of property were accepted, and 96.97% approved. Of course, one might ask if approval rates for provisional measures are so high, why then are applications for preliminary injunctions only about .01% of the total of disposed cases? The answer seems to be that cases are being rejected in the Case Filing Division of the courts, as I have previously discussed (https://chinaipr.com/2012/03/24/case-filing-in-chinas-courts-and-their-impact-on-ip-cases/). Still there have been some positive signs: the Civil Procedure Law amendments provide for a more expanded role for the courts, the courts granted provisional measures in trade secret cases, and Beijing’s newly established in Beijing Third Intermediate Court, which has jurisdiction over the Beijing headquarters of many multinationals and a large foreign docket, may also play an active role. Foreigners Continue to Play an Active Role in Administrative Litigation. In 2013, the local courts accepted 2,886 intellectual property-related administrative cases of first instance, which was basically no change from last year. Of those accepted, the breakdown by intellectual property branch and percentage change compared to last year is as follows: 697 patent cases, 8.29% lower; 2161 trademark cases, 0.51% higher; 3 copyright cases, no change from last year; 25 cases of other categories, 66.67% higher. Among the disposed first instance cases, those involving foreign parties or Hong Kong, Macao or Taiwan parties were 45.23% of the concluded intellectual property-related first instance administrative cases (1,312). Criminal Cases Continue to Decline, Trade Secret Cases Are Relatively Few. In 2013, new filings for intellectual property-related criminal cases of first instance handled by local courts, were reduced by 28.79% to 9,331 cases. 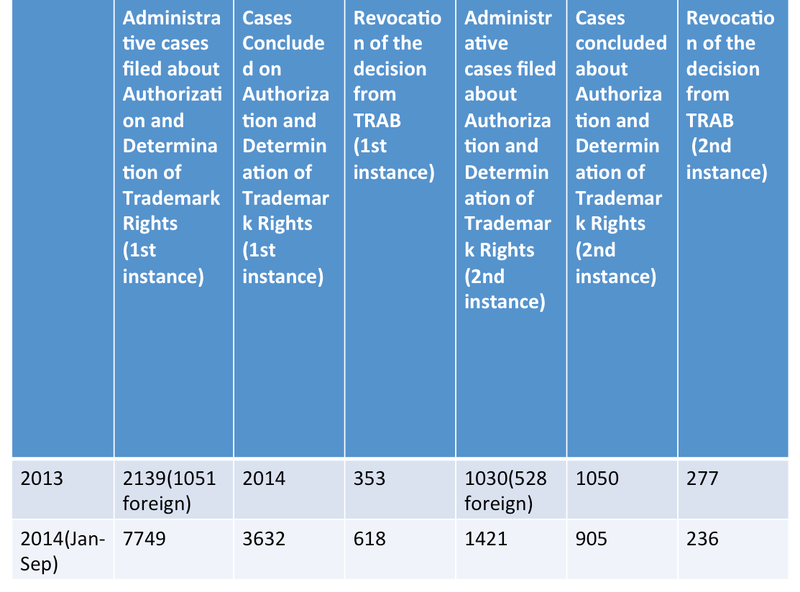 Trademark and trademark-related cases dominated amongst the disposed cases (4,957). Amongst the non-trademark cases, 1,499 cases involved copyright infringement, and 50 cases involved infringement of trade secrets, or about 1% of disposed cases. Transparency In Published Decisions Is On the Increase. As at end 2013, 61,368 legally effective written judgments for intellectual property disputes issued by the people’s courts of all levels have been published. By comparison the CIELA.CN database has analyzed about 25,877 cases as of today. The SPC is Also Actively Participating in Trade Talks. The SPC has sent representatives to participate in intellectual property work groups meetings between China and the United States, Europe, Russia and Switzerland, as well as in international meetings on negotiations of China-Switzerland and China-Korea free trade agreements.